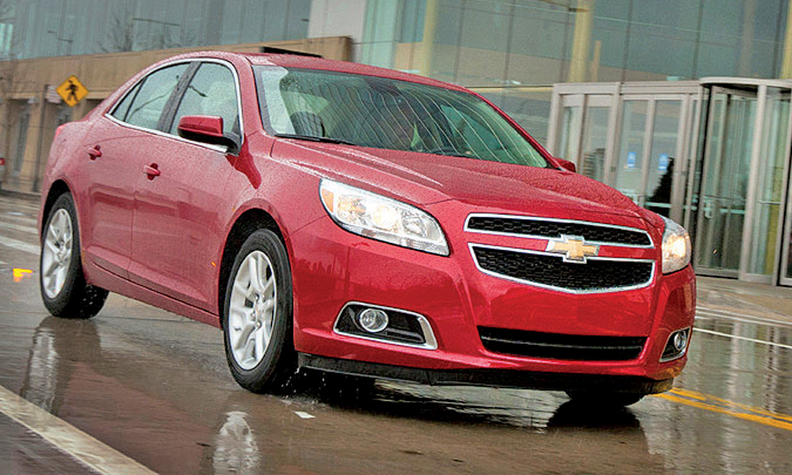 The 2013 Malibu Eco gets stop-start technology. Stop-start technology has been a mainstay of hybrids and in Asia and Europe. Now it's going mainstream in Detroit. The 2013 Ford Fusion and the 2013 Chevrolet Malibu have stop-start systems. The stop-start equipped Malibu Eco, which went on sale this year, climbs to 29 mpg combined city and highway, up from 26 for the outgoing Malibu. The EPA has not yet rated the 2013 Fusion's fuel economy, but Ford promises a similar increase. Stop-start on the Fusion is a $295 option. Stop-start halts the engine when the car comes to a standstill and restarts it when the driver releases the brake pedal. In stop mode, the vehicle's electrical systems run on battery power. The shutdown at stops can improve fuel economy by about 10 percent. Stop-start systems are old hat on hybrids such as the Toyota Prius, Honda Insight and the Ford Fusion Hybrid. The systems have been used since the 1980s in Asia and Europe, mostly in small, eco-friendly models, and now on high-end models from the likes of BMW and Porsche. But U.S. automakers have been slow to embrace stop-start in mass-market models. Kia has delayed a planned stop-start system on its 2012 Rio. To support stop-start, the Fusion and Malibu Eco required changes. Explains Daryl Wilson, GM's lead engineer on eAssist, traditional hydraulic pumps temporarily lose their source of power when the engine isn't running. To get around that, the Ford and Chevrolet models moved to electric-power steering systems.